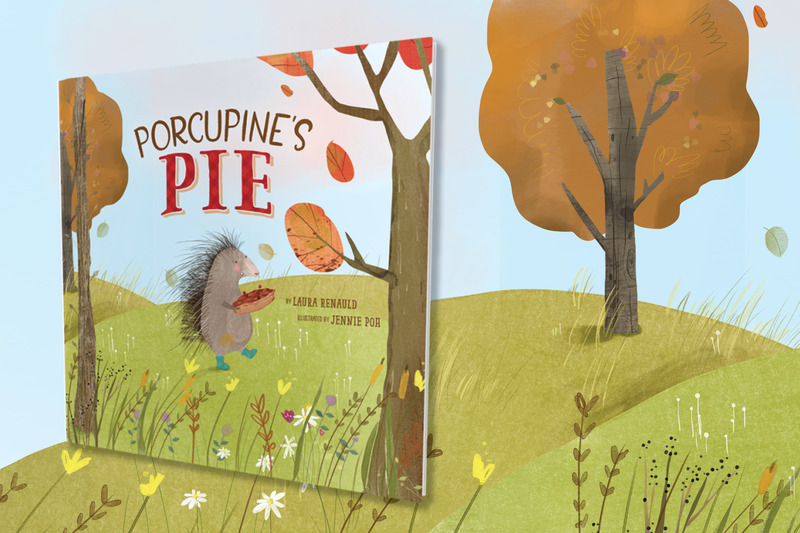 Today we are celebrating the publication of Porcupine’s Pie! We talked to Laura Renauld about her writing process and more about her captivating story. A: I’ve always been a reader. Some of my fondest childhood memories involve books. I didn’t know I wanted to be a writer until I started teaching third grade and I could see the immediate impact books had on my students. Stories engaged them, encouraged them, and entertained them. Doing a read-aloud became my favorite part of the day. And it didn’t hurt that a classroom full of eight-year-olds gave me lots of story ideas! Q: How did you come up with the idea for Porcupine’s Pie? A: I have been an enthusiastic participant in Tara Lazar’s Picture Book Idea Month or PiBoIdMo (now Storystorm) since 2011. I was inspired by Tammi Sauer’s post during PiBoIdMo 2014, which challenged writers to frame a story as a How-To Book. My brainstorming that day included this jot in my notebook, “How to make porcupine pie (or a pie for a porcupine).” Even though it didn’t evolve into a How-To Book, that was the beginning! Q: What did your writing process for Porcupine’s Pie look like? A: My writing process involves a lot of play. I loved the alliteration of Porcupine Pie, but I didn’t want it to be a book about a Porcupine being made into a pie (too dark!). Porcupine’s Pie sounded good and a porcupine as a main character felt right. From there, I brainstormed possible plots. Early on, the woodland animals hoarded ingredients and Porcupine didn’t have enough for her special pie. But that storyline was too sour. A story ending in a Friendship Pie needed to be sweet! I finally landed on the plot that Beaming Books published, which highlights friendship, generosity, and community. Q: What was the first thing you did after finding out that you won the Beaming Books Picture Book Contest (formerly Sparkhouse Family Picture Book Contest)? A: When I received the email from Sparkhouse Family that I had won, I was actively seeking an agent and submitting manuscripts to open publishers. Getting rejections in my inbox was a regular occurrence. I had to read the email two or three times before it sunk in that I was reading an acceptance letter. It was thrilling! I shared my good news right away with my husband, my kids, my parents, and all the people in my life who were cheering on my budding writing career. Q: What would you like to say to readers about Porcupine’s Pie? A: Creating a recipe to go with my story was super fun. I felt like I was running a test kitchen, making pies with different combinations and proportions of ingredients. My friends and family got to be the taste testers, so the recipe was truly a community effort, just like the pie that Porcupine and her friends make in the book. Enjoy! To learn more about Porcupine’s Pie, click here.